Résumé of David Ortega Sr. I am a highly organized, results-oriented manufacturing professional with 30+ years of progressive and comprehensive experience seeking a challenging position in a Fabricating or Manufacturing / Long Run or Short Run Production environment. I offer excellent written and verbal communication skills, computer skills, plus experience and abilities in Continuous Quality Improvement that contribute to productivity, efficiency and profitability. B2B Website for the strategic sourcing of “custom” and “made-to-order” precision machined parts. Developed the “New Component” Web Site information page requirements for each process. Developed the “Member Capability” Web Site information pages. Developed standards for posting drawings, images and specifications to the RFQsolutions Site. This included file formats, image formats, and specification standards. Developed specific capability data for the Precision Manufacturing Industry and developed a prioritized target Industry list. Created the initial conceptual digital images of over 85 web pages on Corel Draw. Investigated member complaints regarding site functionality. Assisted members in the completion of their profile pages. Created AutoCad files from faxed images and PDF files from AutoCad files uploading to member’s RFQ. Examined member profile pages to determine accuracy of member complaints and to assign responsibility for errors. Prepared and presented “Site Tours” at Steering Committee Meetings. Recommended to supervisor improvements in web page layouts and web page content. As the Director of Operations, I report to the CEO of Photomatrix Corporation. Performed a domain name search on the World Wide Web, and registered www.amcraftcorp.com as a domain name for Amcraft Corporation. Designed and built the Amcraft Corporation Web Site located at http://www.amcraftcorp.com to serve as a sales aid. Refined and documented process flows for both the administrative and manufacturing aspects of a Request for Quote and Purchase Order Flow. This created a clearer understanding of individual responsibilities and in general promoted a smoother and more efficient level of inter action between team member. 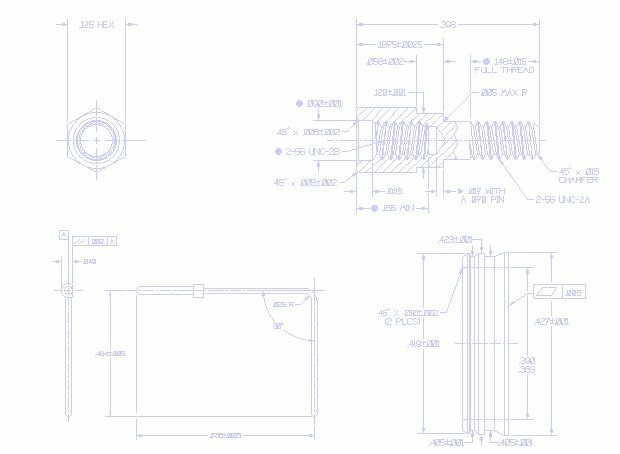 Gave Amcraft the ability to provide our customers with drawings of their prototype and production parts. Visualized and planned the physical move of Amcraft Corporation from a 9,000 sq. ft. facility in Carlsbad, CA to an 80,000 sq. ft. facility in Oceanside, CA. This included the planning and creation of a timeline, procurement of estimates from a variety of suppliers such as carpenters, electricians, riggers, movers, Network Engineers, Fencing Contractors, etc. as well as awarding of Purchase Orders. I maintained the timeline current with completion percentages and modified the plan as required. Conferring with other management personnel to establish production and quality control standards and the development of cost controls. Planning and directing production activities and establishing production priorities for products in keeping with effective operations and cost factors. Coordinating production activities with Production Control, Manufacturing, Engineering, Programming, Purchasing, Maintenance, and Quality Assurance to obtain optimum production and utilization of human resources, machines, and equipment. Reviewing and analyzing production, quality control, maintenance, and operational reports to determine causes of nonconformity with product specifications, and operating or production problems. Developing and implementing operating methods and procedures designed to eliminate operating problems and improve product quality. Revising production schedules and priorities as a result of equipment failure or operating problems. Consulting with engineering personnel relative to modification of machines and equipment in order to improve production and quality of products. Conducting hearings to resolve or effect settlement of employee problems and referring unresolved issues to Human Resources for further action. Compiling, analyzing, storing, and retrieving of production data. Began as Manufacturing Manager in this start-up company of what ended up being a 144 man company. Primary responsibility was to oversee the manufacture of Equipment Sets based on a yearly build plan. Primary responsibility for Building Security. Created a Manufacturing Labor Tracking Method that would allow me to track, categorize and analyze 100% of both direct and indirect labor performed by the Manufacturing Department. There was no system at the time that would accomplish this. Worked closely with Design Engineers and Electrical Engineers to assess the manufacturability of a variety of designs. Appointed liaison between CSI and Architect hired to oversee the completion of a new 32,000 sq. ft. building. Visualized and planned the physical move of CSI from a location comprised of 4 suites in Fallbrook, CA to a 32,000 sq. ft. facility also in Fallbrook, CA. This included the planning and creation of a timeline, procurement of estimates from a variety of suppliers such as carpenters, electricians, riggers, movers, Network Engineers, Fencing Contractors, etc. as well as awarding of Purchase Orders. I maintained the timeline current with completion percentages and modified the plan as required. Aqueous In-Line Cleaning Systems for the Printed Circuit Board Industry. Conceived many improved and original component designs used in the fabrication of poly-propylene cabinets. Designed cost cutting templates to be used in the manufacture of cabinet panels. Specialized in the redesign of multi-part panels into one single panel which were less labor intensive and more appealing to the eye. On-time delivery of the Customer's product was my responsibility. Coordinated a construction project for the building of a Demo Room in which the company could install examples of our equipment. I managed 3 subordinate supervisors who supervised a total of 35 employees in the Manufacturing, Manufacturing Engineering and Production Control Departments. I was responsible for the overall direction, coordination, and evaluation of these units. I carried out my managerial responsibilities in accordance with Tooltronics policies and applicable laws. My responsibilities included interviewing, hiring and training employees; planning, assigning, and directing work; appraising performance; rewarding and disciplining employees; addressing complaints and resolving problems. In the 12 years that I was employed by TMI, I performed many varied tasks and under a variety of titles. I initially was hired as a Department Supervisor and ultimately held the position of Assistant General Manager. As the Assistant General Manager, I reported to the General Manager. Hired as Department Supervisor in the Data Arm Department in Carson, CA. As the Carson Facility Plant Superintendent, I was responsible for the Deburr, Data Arm, Broach, Lapping, Punch Press, Tumble, Double Disc Grind and Tooling Departments. These departments ran 3 shifts and totaled 123 employees. I was responsible for preparing and clearing the facility as part of a relocation from Carson, CA to Oceanside, CA. Assigned as Manager of Human Resources and as such, worked with the Office of Federal Contract Compliance. Wrote a program that would track all employees and their relative data. This program would also generate an EEO-1 report. This program was written in dBase III-Plus. Assigned as Production Manager. Company strength was at 285 employees. Assigned as Assistant General Manager. Responsibilities included directing and coordinating activities relative to attainment of Boeing Aircraft's D1-9000 Certification as well as overseeing the implementation and maintenance of TMI's Advanced Quality System. Certification was achieved in 3 months. As the Statistical Process Control Coordinator for TMI Industries, I planned data collection, and analyzed and interpreted numerical data from design of experiments, probability studies, control charts and other sources. I applied statistical methodology to provide information for statistical analysis and process control by performing the following duties. Conducted studies utilizing sampling techniques. Evaluated reliability of the source of information, adjusted and weighed raw data, and organized the results into a form compatible with analysis by computers or other methods. Presented numerical information (Cpk Index) by computer readouts, graphs, charts, tables, written reports and other methods. Described sources of information, and limitations on reliability and usability. Analyzed and interpreted statistics to point up significant differences in relationships among sources of information, and prepared conclusions and forecasts based on data summaries. Taught Basic and Advanced Statistical Process Control (English and Spanish) to employees by performing the following duties. Instructed employees on control chart principles, construction, calculation and interpretation by lectures, demonstrations, and the use of audiovisual aids and other materials to supplement presentations. Administered tests to evaluate employee progress, recorded results, and issued reports to inform the employee and employees supervisor of progress. Oversaw the data collection on control charts on the shop floor. I have had hands on involvement in teaching and applying Statistical Process Control concepts and principles in a manufacturing environment since 1989. Company trained employees would monitor and control their process using control charts of the appropriate configuration. Control limits as well as Capability Indexes would be calculated by the employee at the work station and appropriate actions would be taken based on the resulting Capability Index. I have provided SPC Training to many people from varied backgrounds (Machine Operators to Staff Managers) in both English and Spanish. The class environments have ranged from informal to formal with “Employee Evaluations” and Certificates awarded to those employees who met the grade. Class subject matter ranges from basic shop math used in SPC to Advanced Problem Solving Techniques for Supervisors and Managers. SOURCECORP is a business process outsourcing (BPO) and consulting firm that offers solutions and industry expertise to clients throughout the United States that transform their business processes and accelerates their business performance. SourceCorp supports information intensive industries such as Commercial, Financial, Government, Healthcare and Legal services. Iron Mountain provides a full range of records storage and management services to organizations of all types and sizes.